Triflusal is a drug that inhibits platelet aggregation. In this study we investigated the dose-exposure-response relationship of a triflusal formulation by population pharmacokinetic (PK) and pharmacodynamic (PD) modeling of its main active metabolite, hydroxy-4-(trifluoromethyl) benzoic acid (HTB). This study was a randomized, open-label, multiple-dose, two-period, two-treatment, comparative crossover design. All volunteers received a single oral loading dose of 900 mg of triflusal on Day 1, followed by a dose of 600 mg/day from Day 2 to 9. Using data from 34 healthy volunteers, 476 HTB plasma concentration data points and 340 platelet aggregation data points were used to construct PK and PD models respectively using NONMEM (version 6.2). As the PD endpoint was qualitative, we implemented binary analysis of ‘inhibition’ and ‘non-inhibition’ rather than using the actual value of the test. The final PK-PD model was evaluated using a visual predictive check (VPC) and bootstrap. The time-concentration profile of HTB over the entire dosing period was described by a one-compartment model with a first-order formation rate constant for HTB. Weight was selected as a covariate for clearance and volume of triflusal, respectively. The structure and the population estimates for triflusal PK were as follows: oral clearance (CL/F) = 0.2 · (weight/71.65)0.845 L/h, oral volume of distribution (V/F) = 8.3 · (weight/71.65) L, and k f = 0.341 h-1. A sigmoid relationship between triflusal concentration and the probability of significant inhibition with shape factor was chosen as the final PD model. No time delay between concentration and response was identified. The final structure between predicted concentration C pred , i j y and the probability of inhibition of platelet aggregation (IPA) relationship was as follows: Probability of I P A = C pred , i j 19 / 84 . 9 19 μ g / mL + C pred , i j 19 . Thus, we concluded this relationship is more like quantal concentration-response relationship. The current dosing regimen was considered to be efficacious based on the EC 50 estimate of 84.9 μg/mL obtained in this study. A PK and binary probability PD model of triflusal was successfully developed for Korean healthy volunteers. The model may be used to further prediction inhibition of platelet aggregation by triflusal. Triflusal (2-acetoxy-4-(trifluoromethyl) benzoic acid), which is chemically related to salicylate  but is not a derivative of acetylsalicylic acid, is an antiplatelet drug [2, 3] that selectively inhibits arachidonic acid (AA) metabolism in platelets by irreversibly inhibiting cyclooxygenase-1 (COX-1) and reduces thromboxane B2 (TXB2) production [4, 5]. 2-Hydroxy-4-(trifluoromethyl) benzoic acid (HTB), the main active metabolite of triflusal, is formed by deacetylation upon passage through the liver . Triflusal is less effective in inhibiting COX-1 and reducing TXB2 than aspirin, but more effective than HTB . HTB increases the effects of triflusal on COX-1 inhibition compared with salicylic acid, the main metabolite of aspirin, which competes with the prodrug for the active site on the cyclooxygenase enzyme [5, 6]. Several previous reports have described the pharmacokinetic (PK) characteristics of triflusal. After oral administration, triflusal is absorbed rapidly within the small intestine, showing an absolute bioavailability of 83–100% . The plasma half-life (T 1/2) is 0.5 ± 0.1 h for triflusal and 34.4 ± 0.1 h for HTB . More than 60% of the parent drug is eliminated by the kidney  and the values for renal clearance for triflusal and HTB were found to be 0.8 ± 0.2 L/h and 0.18 ± 0.04 L/h, respectively [5, 8]. HTB reaches steady-state levels after 8–10 days of treatment . The aim of this study was to quantitatively determine the dose-exposure-response relationship of triflusal in healthy Korean male subjects using a population analysis. Additionally, we suggest a method of binary analysis that might be applied to platelet aggregation data to identify pharmacodynamic (PD) markers. Volunteers aged 20–55 years and within 20% of their ideal body weight [IBW (kg) = height (cm) - 100) × 0.9] were enrolled in the study. Those who were not suitable on the basis of physical examinations and routine laboratory tests (blood hematology, biochemistry, prothrombin time, bleeding time, urinalysis) were excluded. The analysis was performed using data from a randomized, open-label, multiple-dose, two-period, two-treatment, comparative crossover study involving 38 healthy adult males. The clinical trial was conducted at Kyungpook National University Hospital Clinical Trial Center (KNUH CTC) to determine the bioequivalence and non-inferiority of two different triflusal formulations, as reported previously . The study was conducted in accordance with the guidelines of Good Clinical Practice and the Declaration of Helsinki and its amendments at the KNUH CTC, and was approved by the institutional review board at KNUH. Written informed consent was obtained from all volunteers before their participation. Triflusal capsule (Disgren capsule, 300 mg), as the reference formulation, and triflusal EC capsule (Disgren enteric-coated capsule, 300 mg), as the test formulation were manufactured and provided by Myung-In Pharm. Co., Ltd (Seoul, Republic of Korea). The subjects received the test or reference formulation in multiple doses, followed by a 13-day washout period and subsequent administration of the alternative formulation. During each period, each subject received a single 900 mg oral loading dose on Day 1, followed by a 600 mg/day maintenance dose (given as two 300 mg capsules once daily) from Day 2 to 9. For measurement of the plasma concentration of HTB (PK), whole blood samples were obtained at time 0 (pre-dose), and 24, 48, 96, 144, 168, 192, 192.5, 193, 194, 196, 199, 202, and 216 h after the first dose (from Day 1 to Day 10). For platelet aggregation measurements (PD), sampling was performed at time 0 (pre-dose), and 24, 48, 96, 144, 168, 192, 196, 202, and 216 h post-dose. The overall sampling schema is presented in Figure 1. PK and PD study designs. Subjects (n = 34) eligible for this study were given a 900 mg loading dose on day 1, followed by a 600 mg/day maintenance dose on days 2, 3, 5, 7, 8, and 9. For PK assessment, blood samples were obtained at time 0, 24, 48, 96, 144, 168, 192, 192.5, 193, 194, 196, 199, 202 and 216 h. For PD assessment, blood samples were obtained at time 0, 24, 48, 96, 144, 168, 192, 196, 202, and 216 h. PK, pharmacokinetic; PD, pharmacodynamic; IPA, inhibition of platelet aggregation. Blood (7 mL) for PK analysis was collected into tubes containing sodium heparin, and blood (3 mL) for PD analysis was collected into tubes containing 0.109 mmol/L sodium citrate. An aliquot (1 mL) of each plasma sample was placed in a microcentrifuge tube containing 0.1 mL 0.1 M HCl to prevent degradation of triflusal in the plasma. The remaining samples were chilled promptly on crushed ice to maintain the distribution ratio between triflusal and HTB . Concentrations of HTB, rather than triflusal, were measured in this study because the level of triflusal is too low to be detected after 4 h when administered orally, as reported by Lee et al. [4, 10]. Blood samples were analyzed by high-performance liquid chromatography coupled with tandem mass spectrometry (HPLC-MS/MS) . Quantification was performed by multiple reaction monitoring (MRM) transitions. A C18 column was used to separate the components of the samples by chromatography. Linear calibration curves were analyzed in the range of 1 to 300 μg/mL HTB (coefficient of correlation, r = 0.999). The lower limit of quantification of HTB was 1 μg/mL. The intra-day and inter-day % CVs for HTB were each less than 15%. Figure 2 shows the plasma concentrations of HTB with respect to time. Raw data plot of time-concentration-response profile. (a) Profiles of observed individual and median HTB plasma concentration over time. (b) Observed concentration and platelet aggregation at the time of PD sampling. The tubes containing sodium citrate were centrifuged (1,000 rpm, 10 min) and 500 μL of platelet-rich plasma (PRP) was collected as the supernatant. The PRP was transferred to microcentrifuge tubes, which were capped to prevent changes in pH upon exposure to air, and the samples were kept on ice. To obtain 500 μL of platelet-poor plasma (PPP), the remaining sample in the original tubes was centrifuged again (3,000 rpm, 10 min) . Platelet aggregation in PRP was assessed using a Chronolog optical aggregometer (Model 490-4D; Chrono-log, Havertown, PA, USA). Cuvettes were lined up along the two rows of the aggregometer, filled with 250 μL of PRP or PPP, and warmed for 5 min at 37°C . To measure the degree of platelet aggregation, 0.5 μL AA was added to the cuvettes as an agonist, and light transmission aggregometry was observed for 5 min. The aggregometer was calibrated with a cuvette containing PRP, equaling 0% light transmission, as the baseline and with a second cuvette containing PPP, equaling 100% light transmission, as the reference . Based on analyses of the blank plasma samples, which were validated in three individuals, the intra-day and inter-day precisions were calculated as (SD/mean) × 100 (%) and ranged from 2.1 to 6.8% and from 2.1 to 7.6%, respectively . In the current study, PK and PD data from 34 healthy volunteers who received the reference drug were used for population PK-PD analysis. In total, 476 HTB plasma concentration data points and 340 platelet aggregation (%) data points were included. The latent variables used as candidate covariates were age, height, and weight, and levels of albumin, creatinine, serum aspartate transaminase (AST), and alanine transaminase (ALT). Creatinine clearance (CLCR), calculated using the Cockcroft-Gault equation, was also included. where C ij is the j th observed value in the i th individual, and ϵ pro,ij and ϵ add,ij are the residual intra-individual variability with a mean of zero and variances of σ pro 2 and σ add 2 , respectively. A similar approach was made to the PD observations. The standard errors, which give information on the precision of the parameter estimates, were explored using NONMEM’s “$COVARIANCE” step. Models were evaluated using diagnostic scatter plots, goodness-of-fit plots, and the log likelihood ratio test (LRT). The results for LRT were considered statistically significant if the objective function value (OFV) decreased by 3.84 (p = 0.05); this was used as a cut-off criterion for model improvement. where dR/dt is the rate of change of the measured response (R) over time, k in is the turnover input rate for production of the response, I max is the fraction representing the maximal capacity by which the drug can inhibit platelet aggregation (0 ≤ I max ≤ 1), C is the HTB concentration, IC 50 is the median inhibition concentration, and k out is the turnover output rate of the response. where the s0 is an intercept, and s1(X1), · · ·, sp(Xp) are smooth functions that are estimated in a nonparametric fashion. In the equation, candidate covariates with the greatest decrease in the Akaike information criterion were selected as final covariates in the PK model when there was a reduction of at least 3.84 compared with the previous model, and the relationship between the random variable, η, for each parameter and the candidate covariates was improved. Otherwise, they were dropped from the model. Graphical analyses using goodness-of-fit plots – including observed-versus-population-predicted, observed-versus-individual-predicted, and residual diagnostics – were also conducted to diagnose the degree of model development. Bootstrap was recruited to check the robustness of the PK-PD model and parameter estimates. The median value and 95% confidence interval for each parameter were obtained from 1,000 bootstrap dataset. For the PK model, a visual predictive check (VPC) was implemented to further evaluate the accuracy and predictive performance. A total of 1,000 replicate simulation was performed and the 50th (estimated population median), 5th, and 95th percentiles of the created concentrations plotted against time were compared with the overlaid observed concentrations. In addition, predicted concentration-response relationship is plotted with the predicted probability of each concentration data observed at the time of PD sampling. We considered the sample size for having an 80% power at a significance level of 0.05 for bioequivalence trials. It was calculated under the condition of the equivalence limit of 22.3%, the true mean difference of 10%, and the standard deviation of 24.2%. The calculation was performed by a formula suggested from Chow et al. . Volunteers were randomly assigned to one of two sequences with simple randomization using SAS software (ver. 9.2; SAS Institute, Inc., Cary, NC, USA). The demographic data were presented using descriptive statistical analysis performed with the standard SPSS package (version 12.0 for Windows, SPSS, College Station, TX, USA). The mean, standard deviation, and range were obtained for each variable. Volunteers were recruited from August 2008 to September 2008. In total, thirty-eight volunteers were enrolled in this study. 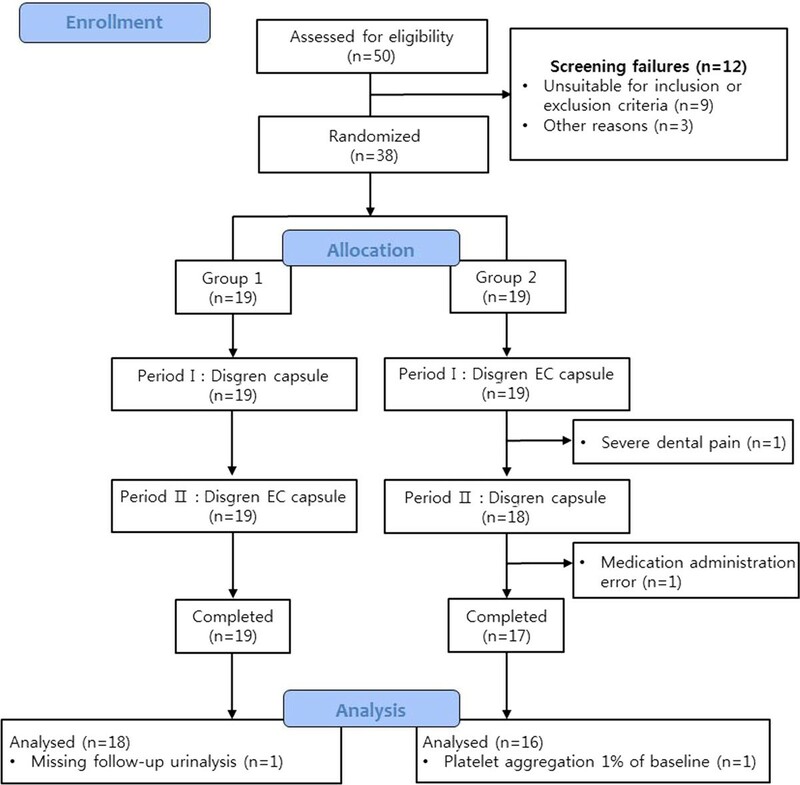 Four subjects dropped out because of severe dental pain, a medication administration error, a missing follow-up urinalysis, or platelet aggregation 1% of baseline in the second period. Data from the remaining 34 subjects were analyzed to construct the PK and PD models. According to the CONSORT flow diagram, Figure 3 shows the subject disposition. The age, height, and weight (means ± SD) of the subjects were 24.1 ± 1.7 years, 176.1 ± 4.9 cm, and 70.8 ± 9.0 kg, respectively (Table 1). CONSORT flow diagram of subject disposition. where θ1 and θ2 were the estimated typical values of CL and V with a median weight (71.65) and θ4 was the estimated influential factor for weight. Weight produced 30.782 (equivalent to p < 0.001, 1 degree of freedom) decrease in the minimized OFV as well as the change in the random BSV for CL/F from 18.5% to 14.9% and for V/F from 15.6% to 9.5% (as % CV). Because only one demographic variable (weight) was selected as a meaningful covariate, the process of backward covariate exclusion was omitted. The goodness-of-fit plots for the final PK model are presented in Figure 4. Final estimates from the PK model, explaining the mean value and the between-subject variability, are listed in Table 2. 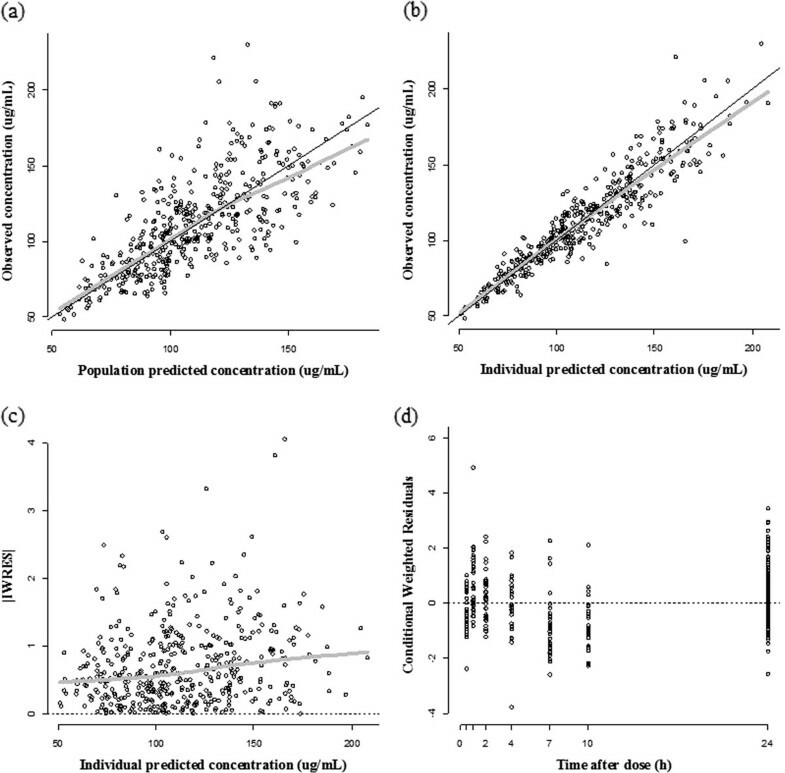 The minimum concentration at steady state (C ss,min ) was estimated to be 103.5 μg/mL using the values of final population PK parameters; in addition, the estimated value of the accumulation factor was 2.26. Goodness-of-fit plots of the final population pharmacokinetic model. (a) OBS versus PRED; (b) OBS versus IPRED; (c) |IWRES| versus IPRED; (d) CWRES versus time-after the last dose. Circle: observation; solid black line: line of identity; gray line: loess regression line. OBS, observation; PRED, population prediction; IPRED, individual prediction; |IWRES|, absolute individual weighted residuals; CWRED, conditional weighted residuals. % RSE, % relative standard error; CI, confidence interval; CL/F, oral clearance; TV, typical value at population level; V d /F, oral volume of distribution; k f , first-order formation rate constant; EC 50 , HTB concentration at which the probability of IPA is 50%; γ, shape factor; BSV, between-subject variability; % CV, % coefficient of variation; NE, not estimated. a% RSE is calculated from ω2. bAdditive residual error was not selected. The binary probability model was selected as the final PK-PD structure. The results of the estimation from this PD model were as follows: γ = 19 and EC 50 = 84.9 μg/mL. In addition to these parameter estimates, information such as the observed and predicted number of times that non-aggregation occurred at each time point is shown in Table 3. The between-subject variability was only applied to EC 50 and was well explained. The values estimated from the PD model are summarized in Table 2. IPA, inhibition of platelet aggregation. The bootstrap results showed acceptable robustness of the model and are presented together with the final estimates in Table 2. The VPC result (Figure 5) showed that the prediction of the simulated data well-matched the observed concentration-time profiles. This graph, representing a visual internal validation of the model, showed that most of the observed data points were overlaid between the 5th and 95th percentiles. Results of model evaluation. (a) Visual predictive check result. The 5th and 95th percentiles (dashed gray line) and the median value (solid black line) from the simulated data are plotted against the observed concentration data (circle) according to time. (b) Predicted HTB concentration-probability of IPA curve; Circle: expected IPA for each HTB concentration measured at the time of PD observation; IPA, inhibition of platelet aggregation. The PK and PD characteristics of triflusal were investigated using a non-linear mixed effects analysis. 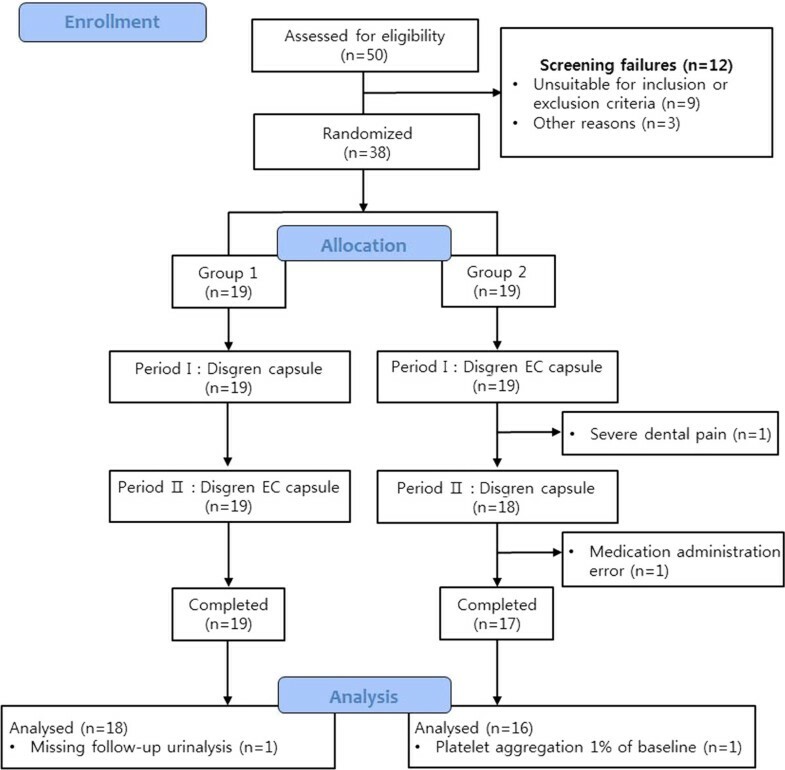 The objective of this study was to develop a population PK and PD model of the triflusal formulation, an established uncoated capsule, in healthy Korean male subjects. Plasma concentrations of the active metabolite, HTB, and the degree of platelet aggregation inhibition were measured to demonstrate the PK and PD properties. Reasonable estimates for parameters of the PK model were obtained, reflecting the potential for accurately predicting the information sought. The plots of the observed concentrations versus population-predicted or individual-predicted concentrations showed that the PK model was well structured, and the plot of time versus conditional weighted residuals suggested that the errors had homogeneous variances. Our final HTB PK structure includes first-order formation and 1-compartment disposition. This is plausible judging from the immediate increase in HTB concentration on the day of full-PK study after dosing time and the rate of concentration increase which is the fastest at immediate post-dose and decreases thereafter (Figure 2). This finding is consistent to the model used by Valle et al. . On the contrary, Yun et al. suggested a 2-compartment model for HTB disposition. But we considered this model would behavior like a 1-compartment model because the distributional rate constant between compartments were much (approximately 60 times) larger than the elimination rate constant and the equilibrium between compartments will be obtained within 1 h after dose. Judging from the time of maximum plasma concentration attainment (postdose 4–5 h), this distributional characteristic might be superimposed by the absorption as well as the elimination. Covariate model building was established by the relationship between the subjects’ body features and parameters in the PK model. Weight accounted for approximately 19 % and 39 % of between-subject variability for CL/F and V/F, respectively, judging from the decrease of ω2 for corresponding parameters. Particularly, V/F was directly proportional to weight (exponent = 1) and the fact suggested that weight may be used as a scaling factor for triflusal dose. However, definite conclusions could not be made for following reason; 1) this study did not consider the PK of triflusal; thus, weight might be influential to the disposition of triflusal including metabolic fraction to HTB (which was only explained with F in this study), 2) the clinical significance of this finding needs further investigations together with its pharmacodynamics variability, therapeutic index and clinical effectiveness. In addition, even though HTB is mainly (>60%) excreted in urine, CLCR was not selected as a meaningful covariate for HTB CL/F. We consider that the effect of weight superimposed that of CLCR. It was expected that studies involving triflusal and HTB PK in patients with various renal function will be essential to elucidate the exact influence of renal function. Based on the value of EC 50 (=84.9 μg/mL) estimated in this study, the current dosing regimen was considered to be efficacious judging from the C ss,min value (=103.5 μg/mL) and the concentration-response relationship which showed quantal characteristics (γ = 19). The saturated value of E max as 1 seemed reasonable, because there was no significant model improvement when the parameter was allowed to be estimated. Another method, the binary probability model to construct the PD model using transformed binary data, was introduced to show characteristics of the PD data without much information loss. This model resulted in successful explanation of binary data characteristics by the estimates, even though a turnover model was not constructed because of the modified binary data characteristics. To date, this is the first report evaluating quantitative PD data transformed into qualitative binary data possessing one of two values. We recommend this new approach of using probability to estimate parameters that show predictive ability for the presence of platelet aggregation. This model also provided a specific method for potential use with binary data in the case of high intra-individual variability for PD. This study has some limitations. First, only HTB concentrations were used in our population PK and PD model without measurement of the parent drug. Although triflusal is a prodrug which has no pharmacologic effect, if a study involving the concentration measurement of both triflusal and HTB is conducted, a better description for the HTB formation will be obtained. This approach may enable the identification of influential factors for HTB formation process including first-pass metabolism and hepatic clearance of triflusal. Second, despite the possible loss of information from the data transformation, a PD model using probability (binary data model) was developed to evaluate the extreme values in our PD data, as seen in the scatter diagram. To overcome this problem, more accurate and precise quantitative analytic method to measure the degree of platelet aggregation should be required. Using the VPC, which is one method of model evaluation, prediction is possible when given not only different dosage- and time-concentrations but also the probability of IPA. Accordingly, optimal dosage regimens could be determined by model-fitted parameter estimates without additional clinical trials. The model may be clinically useful for other similar studies. Finally, this study was conducted in healthy volunteers, rather than in patients. Thus, it is also necessary to construct a model estimating reasonable parameters from patients in a more realistic setting. A PK and binary probability PD model of triflusal was successfully developed for Korean healthy volunteers. The model may be used to further predict inhibition of platelet aggregation by triflusal. This research was supported by grants from the National Project for Personalized Genomic Medicine, Ministry of Health & Welfare, Republic of Korea (A111218-PG02); the Bio & Medical Technology Development Program of the National Research Foundation (NRF) funded by the Ministry of Science, ICT & Future Planning, Republic of Korea (NRF-2013M3A9B6046416); the Pfizer Modeling & Simulation Education Center in Korea (PMECK); and the Korea Health 21 R&D Project, Ministry of Health & Welfare, Republic of Korea (A070001). SMP constructed and developed the PK and PD models and drafted the manuscript. JL, SJS, JGP, MRG, MSL, HWL, DHY, and YRY helped prepare datasets, develop the PK and PD models, and interpret the results of the estimated parameters. KIK and SH designed and supervised the clinical study, developed the PK and PD models, and edited the manuscript. All authors read and approved the final manuscript.